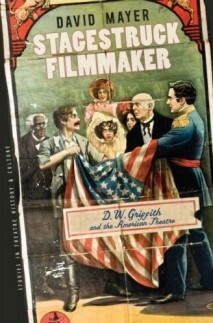 D.W. Griffith, premier filmmaker of the early cinema period, was a man of the theatre. He was an actor and a playwright before, in desperate straights, he found himself having to stoop so low as to act in a film – and then discovered his true vocation, behind the camera. But through all his films Griffith had his eye on the theatre, drawing on its themes, its properties and its particular craft. However, this crucial element of Griffith’s artistic make-up has been curiously neglected. The films are seen as pure films in themselves, whereas in fact they owed a huge amount to a richly various theatrical inheritance, and indeed can be looked on (by the trained eye) as records of theatrical practice that would otherwise be lost. This, roughly, is the subject of David Mayer’s Stagestruck Filmmaker: D.W.Griffith and the American Theatre, recently published by University of Iowa Press. Mayer is a historian of nineteenth century theatre, and he brings to his study of Griffith (and to his studies of early film in general) an understanding of the filmmaker’s roots in theatrical practice that is illuminating, and salutary. Simply watching the films in isolation gives you too narrow an idea of how they came to be and what their significance was for audiences at the time. You have to know from where they came, socially and culturally. Combining the raw materials of theatre, circus, minstrelsy, and dance with the newer visual codes of motion pictures, Griffith became the first acknowledged artist of American film. Birth of a Nation in particular demonstrates the degree to which he was influenced by the racist justifications and distorting interpretations of the Civil War and the Reconstruction era. Moving through the major phases of Griffith’s career in chapters organized around key films or groups of films, Mayer provides a mesmerizing account of the American stage and cinema in the final years of the nineteenth century and the first three decades of the twentieth century. Griffith’s relationship to the theatre was intricate, complex, and enduring. Long recognized as the dominant creative figure of American motion pictures, throughout twenty-six years of making more than five hundred films he pillaged, adapted, reshaped, revitalized, preserved, and extolled. By historicizing his representations of race, ethnicity, and otherness, Mayer places Griffith within an overall template of American life in the years when film rivaled and then surpassed the theatre in popularity. The book comes with playlist and well as filmography, and ought to do a lot to reposition Griffith as a man of his times, and his films as mirrors of those times.